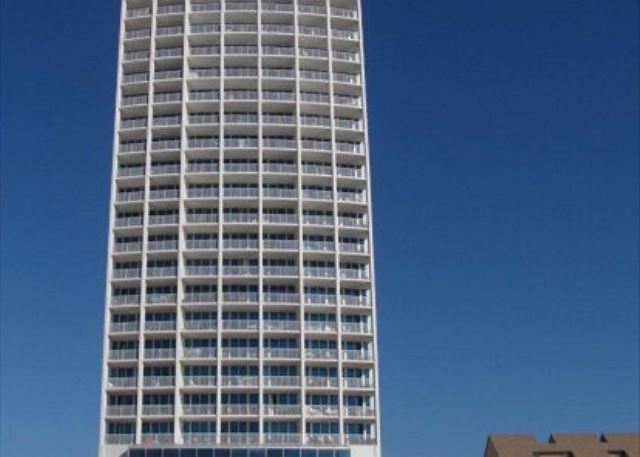 Welcome to Island Tower in Gulf Shores! Island Tower view from the beach. 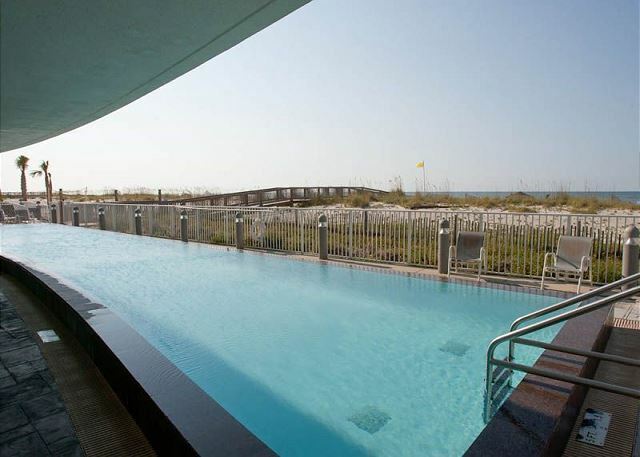 Gulf front location with beach service and indoor pool! 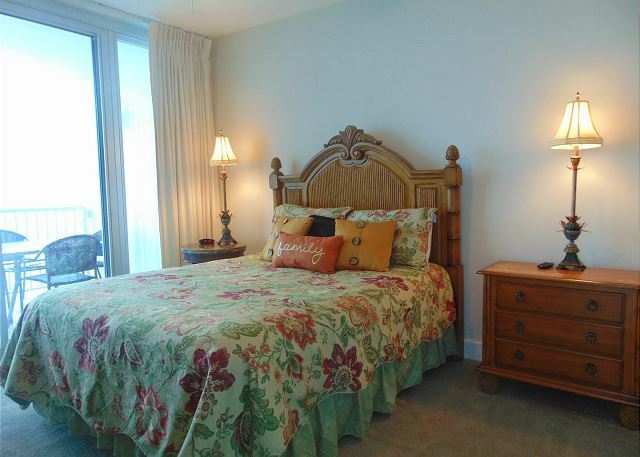 Island Tower 2301 a 3 Bedroom, 3 Bathroom Gulf-front unit with two private balconies, accessible from two bedrooms. The master suite offers a queen bed and private bathroom, outfitted with a Jacuzzi tub and separate walk-in shower. 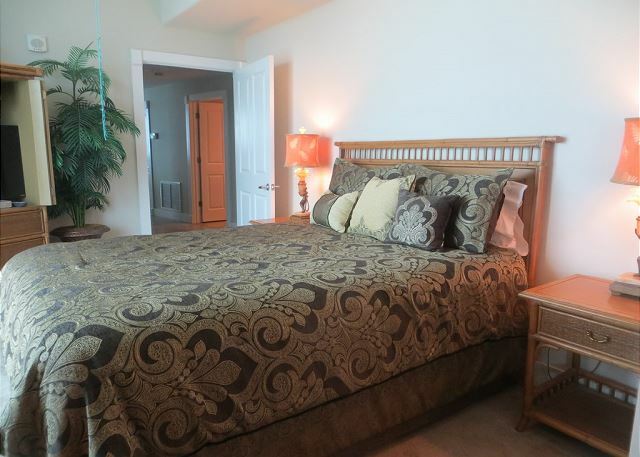 The second and third bedrooms include Queen beds and private bathrooms. 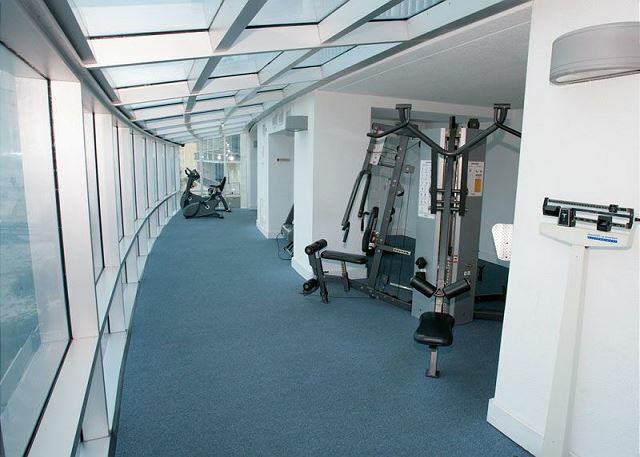 This unit is on the 23rd floor sleeps 8 people. Free wireless internet provided. 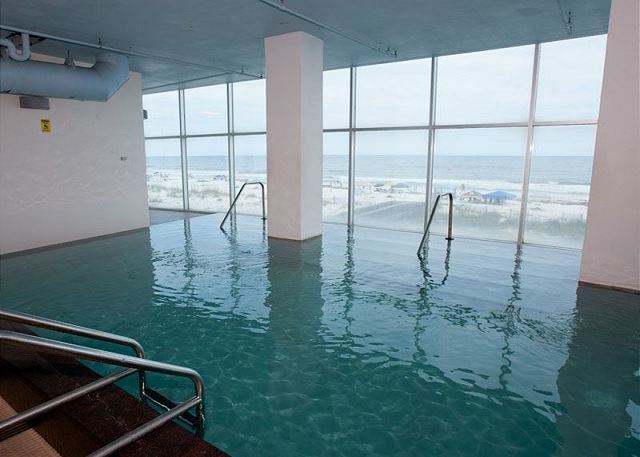 Island Tower amenities include Gulf-front heated indoor pool, sauna, Gulf-front fitness center, large beach-side outdoor pool with lounge area, covered parking, two high-speed elevators and 150 feet of white sandy beach. This property has paid parking. One parking pass is included in the price quote. The property will allow up to two cars per unit. If you want to purchase the 2nd parking pass please let us know. Located .3 miles West of Highway 59 in Gulf Shores. Confirmation of your reservation will be e-mailed or mailed upon receipt of the reservation advance payment. Please read the confirmation for accuracy of dates and accommodations. Any errors must be directed to the reservations department within seven days of mailing. We had a fabulous time! The condo was incredible! Fabulous views...spacious, and super convenient! It was perfect for our family of 4 and my in-laws! thank you for the great comments and review!! We look forward to seeing again next year! 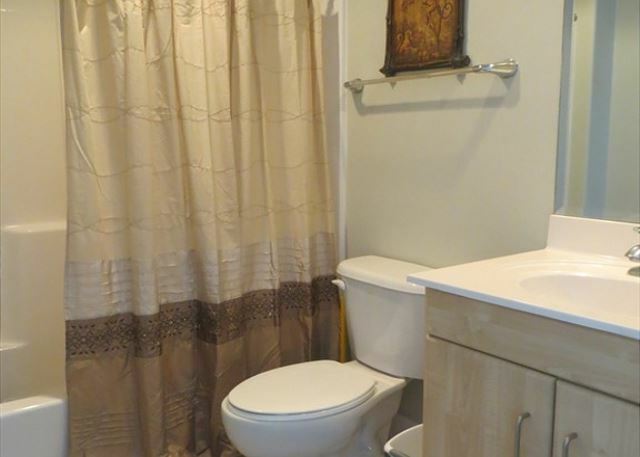 Very clean and close to shopping and dining. Kitchen could have been better stocked (only 1 wine glass - ran out of coffee cups- who wants to keep doing dishes on vacation). We did not get the pool key with our check-in paperwork, but manager was quick to supply when contacted. Restaurant next door was excellent! thank you Terri for your review. We are getting kitchen stocked up and ready for spring and summer for guest! 2301 has a breathtaking view!! Beautifully appointed. Quiet, clean and in a great are on the beach! We came in the off season, so not very busy. thank you Cynthia for the kind and great review! We look forward to seeing you again in February! Gorgeous, well maintained, roomy condo! Thank you Michelle for the great review and comments! We look forward to seeing you again next year! This review is to praise Aqua Vacations. There is nothing I can add to the many positive reviews those before me have submitted. My wife and I booked a last minute beach trip for ourselves, two nieces and two grandchildren to provide them a last hurrah before beginning school. 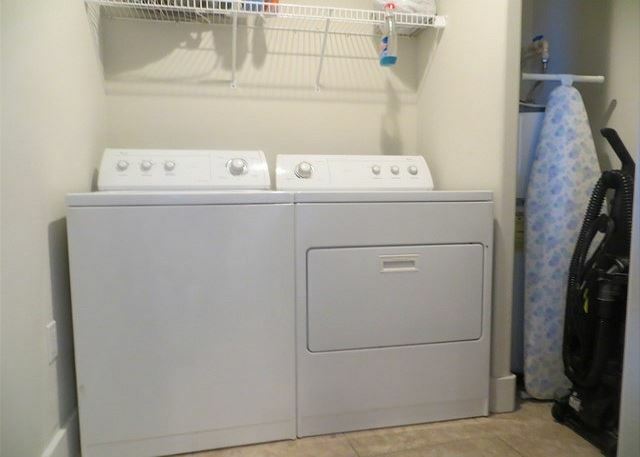 I found this unit on VRBO, then contacted Aqua, immediately saving VRBO's $153 extortion, uh, I mean fee just for the privilege of renting through them. I initially spoke with Linda, who was on her way to the hospital to see about her mother. Despite the stress of the situation, she gave me great information. Next day, I spoke with owner Dana and received a great rate. I will definitely call them again! Thank you, Dana, and I am praying for your mother, Linda. BTW, cross the street to the Flip Flop Deli Shop. Great sandwiches and delicious ice cream! Thank you Dennis Family for the great comment and review!! We look forward to having you and your family again next year! The room was very clean. Walking distance to food and entertainment. The only problem was, I did not know there was an additional fee for a parking pass until after I booked and paid in full. I did not see anything about the extra fee ahead of time. Great vacation experience with awesome view! Had a great time and cleaning lady even came by to make sure everything was satisfactory. Very clean and up to date condo!!! Overall we were impressed with the incredible view. The location was ideal also. When we attempted to check in during business hours, unfortunately no one was in the rental office. We attempted to call to see if we could check in, unfortunately the voicemail box for the number was not set up. After we got our key and parking permit we were off to the room. Upon entering the room, we noticed many lights were out, bathroom exhaust fans weren't working, there were some needed cleaning utensils for quick clean ups of sand, a tv remove was missing, and some needed kitchen utensils and supplies were lacking. A thank you to Aqua Vacations who helped us out by dropping off some supplies after we noticed some issues with the room, mid week, after we contacted them. a guest from Smyrna, GA does not recommend this vacation rental. One of the prettiest views on the beach, and that mostly made up for the hiccups that we experienced. 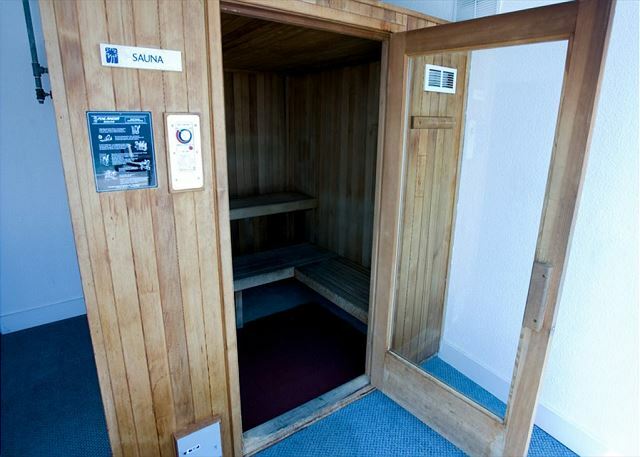 Upon arrival, the unit had an incredibly strong smell. It smelled like someone had been smoking in the unit, and then attempted to cover it up with some awful fragrance. It is possible that the smell was related to moisture instead, as it appears that the unit had been vacant for a bit before our arrival, and the A/C unit had been completely turned off. The floors were also very sticky, and we could not walk barefoot inside. In addition, the promised (as stipulated in the rental agreement) cleaning and laundry supplies were not provided. When alerted to the missing supplies, the property mangers first disagreed with me, then refused to respond to emails or phone calls. In addition, we have a handicapped daughter in a wheelchair. The parking deck was undergoing renovations while we were there, of which we were not informed even though we booked just three days before our arrival, and the handicapped spaces were not available, with no alternative accommodations. I reached out to the property manager for help, and they just told me to contact someone else, but did not assist in providing contact information. Again, the view and location are unbeatable, but I would strongly recommend looking for a different unit in this building with different management. Our island vacation was wonderful. So close to a lot of amenities, such as restaurants, dolphin cruises, and of course shops of all kinds. We had a tremendous view of the gulf, it was breathtaking, especially the sunrises almost every morning. Our condo was well kept, updated, clean. Everything we needed was provided for us. We just requested more cleaning supplies because we were staying for (9) nine days. The beds were very comfortable & firm. That was very important for my sister and I because of our backs. The elevators were very efficient & fast. The only thing was when you pushed one elevator, you weren't sure which one would open, and they were a little distance apart, so we stood in the middle of both a lot of times.Lol! The pools were wonderful, well kept, clean and full to overflowing at all times. Very quiet for us because we went in the off-season, which we loved. 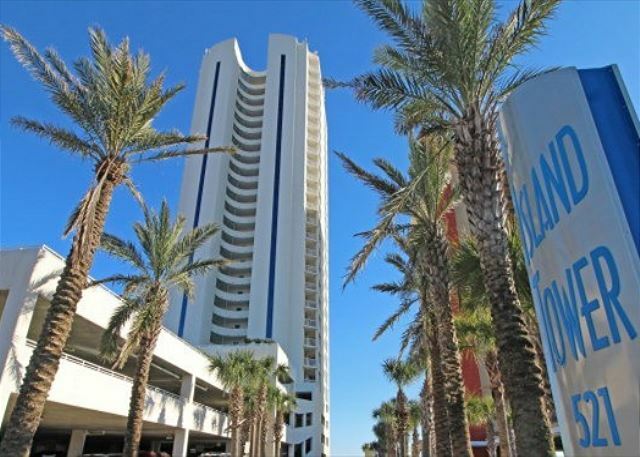 Overall, we loved our stay & would let everyone know that Island Towers is the place to stay when in Gulf Shores. Great condo! Very clean, amazing view. Love that there were different balconys and that you had a view of the beach on both of them. Great experience definitely recommend. We had an incredible time with 4 couples at Island Tower. 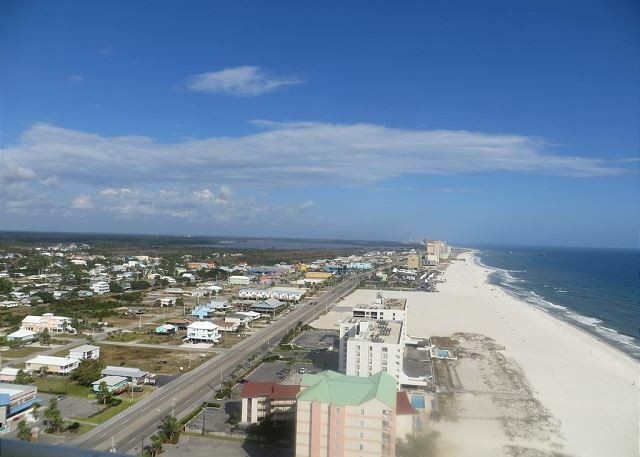 The view of the beach from the 23rd floor balcony is incredible to wake up to and there are no high rises several miles east, giving awesome unobstructed views of the ocean. I would not hesitate to rent this property again. Brittney V does not recommend this vacation rental. 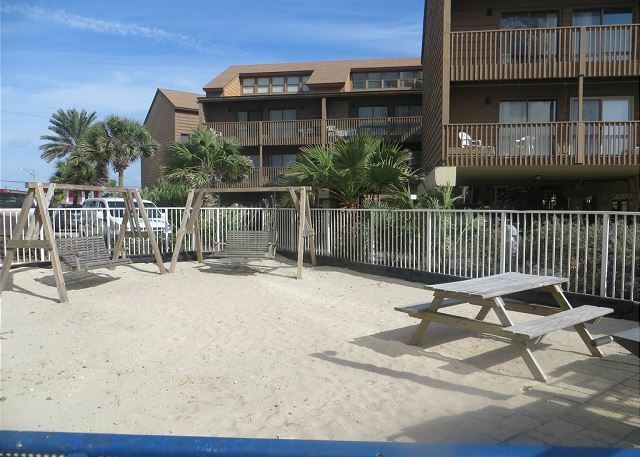 This unit is in a great location and has an unbelievable view! The kitchen is nice and worked well for us. The unit itself is pretty outdated though. The kid's room is so small that you can't shut the door without having to move the bed and comforter in with your hand while shutting the door. The beds in this room are very narrow and are made for small children. The water pressure in the kid's shower is also very low so it took our daughter quite a bit of time to rinse off and get the shampoo and conditioner out of her hair. 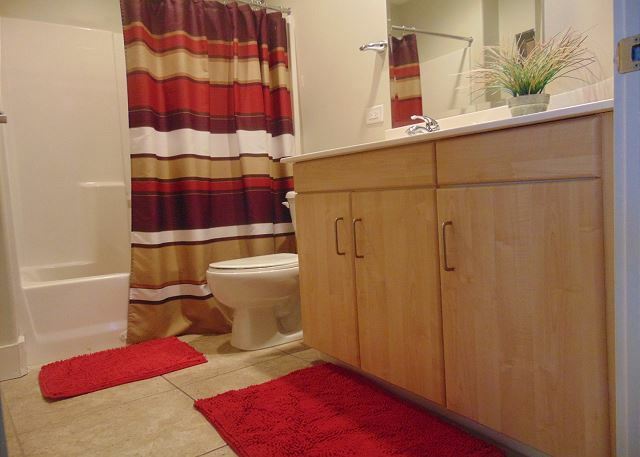 The toilet in the master bedroom has no door, which makes it very awkward. In all we were disappointed in the general condition of this unit. It looked better in the pictures. We also found the property management company not to be the most accommodating. We will not be staying here again. Oh my, we couldn't have been happier to walk into the unit and see just how fabulous it is! From the deco, furnishings, and cleanliness everything was just outstanding! Of course, the view was spectacular. The property is in a great building and has a great view. 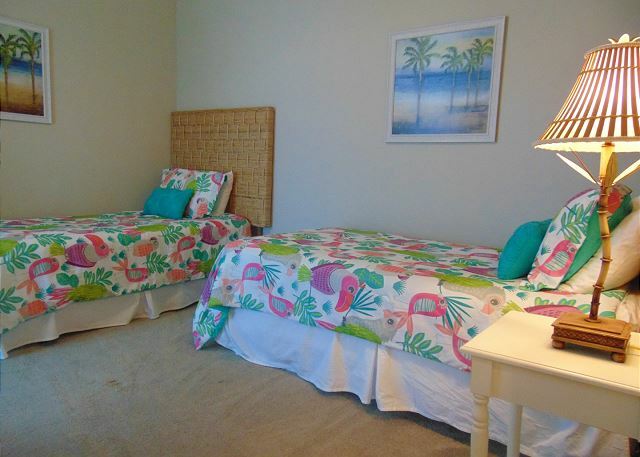 There is an abundance of room and storage, Kitchen is well stocked and beds were comfortable. The property is in need of a deep cleaning. The carpets were dirty as well as the sofa. I would recommended this condo if the living area furniture was to be updated. We had the best vacation ever. Great weather great accomadations. The condo is beautifully decorated and well equiped kitchen. We will be staying there again next year for six weeks. Highly reccomend it to everyone. Lauren C does not recommend this vacation rental. We have stayed at island tower many times but it was a first for 2301. While on the surface the place appeared clean there was dust everywhere around the TV, under the glass tops, the artificial plants were just covered. The couch is sitting on a tile floor and you can see underneath it - just filthy. All the furnishings need an update for sure. The beds were the most uncomfortable I've ever slept on. Could be a great place if someone would give it a little attention rather than surface cleaning it each time. Absolutely no complaints! We could not have asked for a better condo rental! 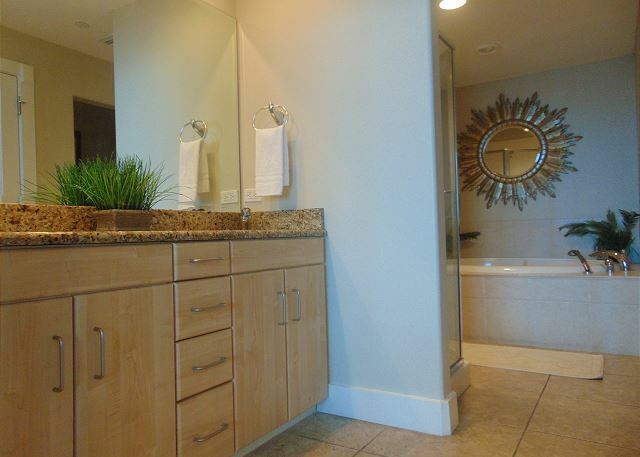 Condo was spotless, location was perfect, and the condo management was remarkable. We are looking forward to booking this condo again in the future. Great Vacation in Gulf Shores. Accommodations were excellent!! Very East to Check-in and Out. Going stay at Island Tower next year!! Close to everything! What a great trip. Building and location was perfect. Management team took care of all our needs and requests. Would absolutely recommend to any travelers with or without kids. This was our 1st stay outside OBA. I chose Island Towers bc I have 4 teenagers who wanted to be at The Hangout every night & I wanted them to be able to walk. They could. It was .10/mile. When we arrived, we found the parking suitable....except the ramps to go up into the parking deck where so incredibly tight, I was afraid my suv wouldn't make it. 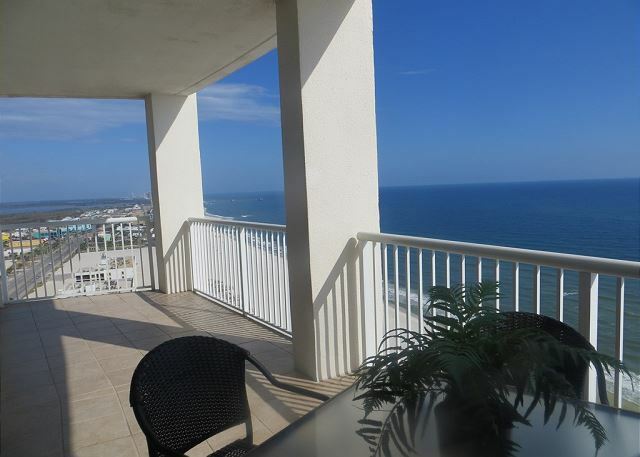 The condo was on the 23rd floor & the view was the best I've ever had of the gulf. GORGEOUS! Floor to ceiling windows on a corner unit make a HUGE difference! The condo was clean, very well equipped & spacious.one bed didn't have too sheet, but I called & a new set was delivered within the hour.Very big master bath. The only issues: The balcony furniture was rusty & old. There were only 4 chairs for a condo that boasts it sleeps 8. It could've used more outdoor seating. One of the 2 elevators went out Friday & was not fixed until Monday. This made for a long wait over Memorial Day weekend. The kids seemed to like the indoor pool....I spent all my time at the beach. Very short walk from lobby to sand??. Great experience! Clean condo, well maintained. Excellent rate!